MOTORISTS are being warned of the risk of collisions with deer as the clocks turn back this weekend. Car accidents involving deer peak at this time of year. With night falling earlier, the peak commuting time coincides with deer coming out to feed on grass verges near roadsides. Scottish Natural Heritage, in conjunction with Transport Scotland and Traffic Scotland, are placing warning messages on electronic messaging signs in key locations, particularly in west and northwest Scotland. From 28 October to 18 November, the signs will warn motorists on the main trunk roads of the A9, A87, A82 and the A835. The most recent deer-vehicle collisions research indicates there are more than 7000 deer-related motor vehicle accidents every year in Scotland, on average causing about 70 human injuries. The economic value of these accidents is near £5 million. Across the UK, it’s estimated there could be up to 74,000 collisions of vehicles with deer, resulting in 400 to 700 human injuries and up to 20 deaths. The combined economic impact through injury accidents and significant damage to vehicles approaches £47m. Many people think most incidents with deer occur on more remote Highland roads, but up to 70 percent occur on trunk roads or motorways. In addition, when traffic volume is taken into consideration, the risk of a collision with a deer is about twice as high per vehicle-mile driven in Scotland compared to England, according to the Deer Vehicle Collisions Project. Sinclair Coghill, SNH deer management officer, said: “From October to December, there is a higher risk of deer on the road as deer move down to lower lying ground for forage and shelter, with the highest risk from sunset to midnight and shortly before and after sunrise. • Try not to suddenly swerve to avoid hitting a deer. A collision into oncoming traffic could be even worse. • Only break sharply and stop if there is no danger of being hit by following or oncoming traffic. 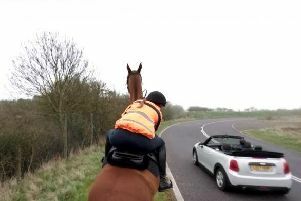 Try to come to a stop as far away from the animals as possible to allow them to leave the roadside without panic, and use your hazard warning lights. • Be aware that more deer may cross after the one or two you first see, as deer often travel in groups. • After dark, use full-beams when there is no oncoming traffic, as this will illuminate the eyes of deer on or near a roadway and give you more time to react. But dim your headlights when you see a deer or other animal on the road so you don’t startle it. • Report any deer-vehicle collisions to the police, who will contact the local person who can best help with an injured deer at the roadside. Do not approach an injured deer yourself as it may be dangerous.